With issues of income inequality, economic mobility and overall opportunity once again part of the national discourse, it was timely of the folks at Planet Money, NPR’s economics blog, to look into the relationship between people’s current incomes and occupations and the circumstances in which they grew up — specifically, whether they grew up in rich or poor families. The result is this graph, which packs in several dimensions of socioeconomic data. Planet Money used data from the National Longitudinal Surveys, which has been following a nationally representative sample of 12,686 men and women since 1979, when they were 14 to 22 years old. For those in 30 occupational categories (chosen because “we thought [they] would be interesting and understandable”), Planet Money plotted their current income against their median family income in 1979, adjusted for inflation. Datapoints above the diagonal line indicate people who are now earning more than their parents; points below the line indicate people earning less. 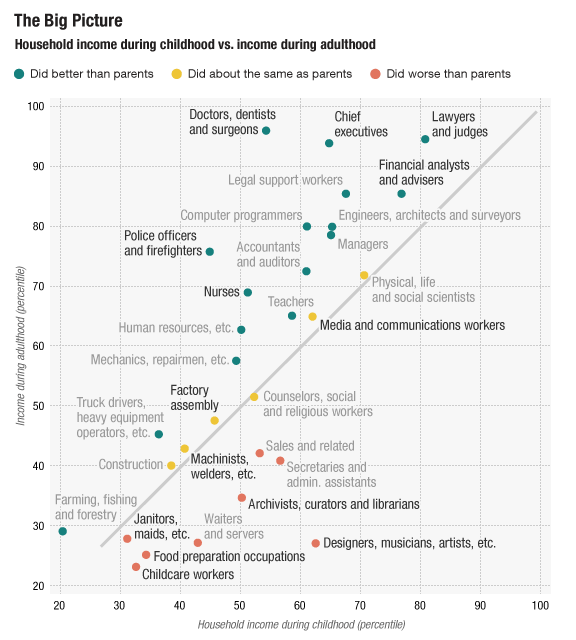 As might be expected, people in certain high-earning occupations (lawyers, scientists, financial analysts) tended to grow up in wealthier families, while people in many low-paying jobs (childcare workers, food prep, janitors and maids) grew up in poorer households. What’s interesting, though, are the departures from that broad trend. Doctors, dentists and surgeons as a group were the highest-paid among the occupations studied, but they grew up in families just slightly above median income. Police officers and firefighters, whose childhood families were around the 45th percentile in income, now out-earn about 75% of the population. But people in artistic/creative occupations, who grew up in relatively well-off families (above the 60th percentile), now are doing considerably worse, income-wise, than their parents.